We have litters of seal point and lynx point kittens that are both due to be born the week of June 10th. The kittens pictured are from a previous litter and are the same type we are expecting. (kitten on the left is a lynx and kitten on the right is a seal point) If you would like to be added to the waiting list please text your full name and kitten type to telephone number (201)398-6766. Thanks and have a blessed day. 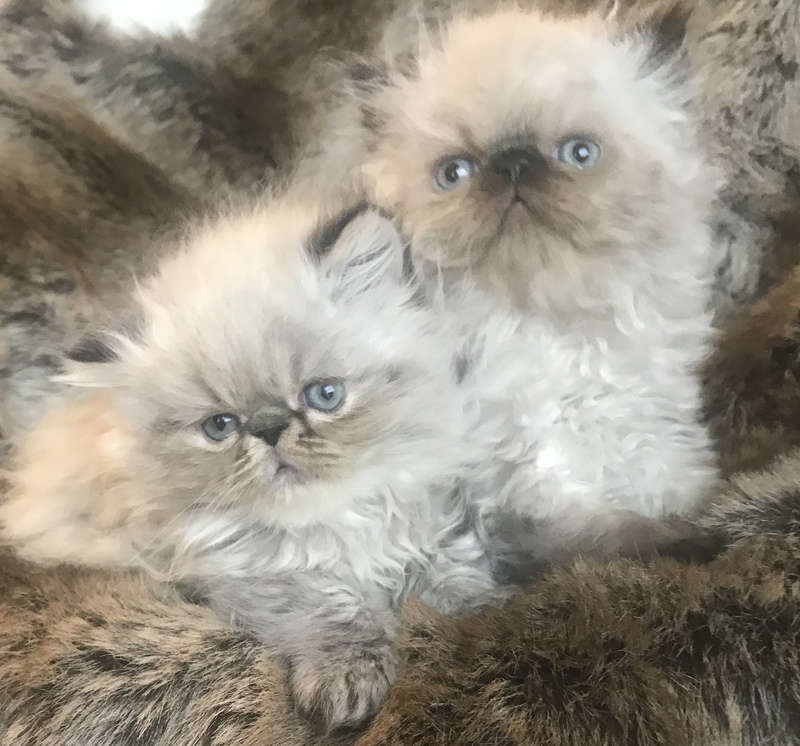 Before a prospective owner starts searching for a pedigreed Persian or Himalayan kitten they must realize that good quality kittens do not come cheap. You may find breeders selling kittens for $800 or less, however in my personal opinion you get what you pay for. Cheaper is not always better. For example you may find a kitten for $500, however you just may wind up with $5000 in vet bills if you purchase from a irresponsible breeder. Good reputable breeders spend a great deal financially to ensure healthy queens and sires which in turn makes healthy babies. Here at Khloes Kittens we take absolutely no short cuts when it comes to medical care, keeping our cattery sanitized, and putting in a great deal of effort and love so we sell the healthiest and friendliest of kittens. Any good breeder will provide a contract covering the kittens health as well as providing receipts for both the deposits and balances paid. A lot of breeders will not make you aware that their contracts will state you have a certain period of time to get your kitten into the vet in order to be covered by your contract’s health guarantee (usually 72 hours on average) and will spring this information on you at pickup. We provide you your kitten pickup date weeks in advance so you have an ample amount of time to make your vet apointment. Also, You should never give more than a $300 deposit. I’ve had customers come to me stating how another “breeder” took half or all of the kitten price only to never be heard from again. Do your due diligence prior to purchasing a kitten. Read reviews etc I do not believe in caging or shipping kittens as I truly believe this can affect their personalities and can become quite skittish. If your spending a good amount of money on your kitten you don’t want to have one that will be hiding under your couch being anti-social. Some breeders use the selling point that their kittens are vaccinated prior to leaving. I feel that only a licensed veternarian should be administering vaccinations to any cat or kitten and at the appropriate age. (In my opinion as well as many vets vaccinations or altering your kitten too soon can affect a cat’s lifespan) Many factors can affect a cat’s lifespan and it is very important to be well educated. Feel free to contact me anytime with any questions you may have. * Khloes Kittens is NOT a pet store. I want to ensure the best homes for my babies therefore all kittens are sold solely at my discretion. I reserve the right of refusal to sell to anyone at any time for any reason. *Please be advised that it is your responsibility to know whether or not you or a family member in your household is allergic to cats or not. This is not a valid reason for a refund. If you are unsure we recommend that you or your family member be tested prior to sending in a deposit. Thank you. 1) Are the parents in your cattery vaccinated by and seen by a veterinarian? If they say no to either of these questions, or they say they personally vaccinate their own kittens, walk away. All our parents are fully vaccinated by a licensed veternarian. 2) Have your cats been tested for Feline Leukemia & FIV? If they say no, walk away. All our parents are tested and are negative. 3) Were any cats found positive for Feline Leukemia & FIV? If they say yes, walk away. Our parents were tested and are negative. *FELV – Similar But Not Identical To FIV. … disease, feline leukemia virus (FELV). The two diseases do share a lot in common, but there are also some important differences to consider. Both diseases are caused by viruses, as their names imply, and the end result of infection is a weakened immune system. 4) Have all of your queens and sires been tested for PKD? If they say no, walk away. All our parents were tested for pkd and are negative. 5)Were any of your cats found positive for PKD? If they say yes, walk away. Our parents were tested and are all negative. *PKD is a terminal disease, usually striking between the ages of 5 to 8 years of age. Healthy indoor cats that are regularly seen by a veterinarian can easily live to be 17 and older. This disease is cutting their life expectancy by more than half. 6) If I purchase a feline and have it tested for PKD & it comes out positive, what recourse do I have? If they say none, walk away. All our parents have tested negative and we still provide a health guarantee in our contract so our customers have the comfort of knowing we will provide 100% refund in the event your kitten has a life threatening illness. (PKD is hereditary. Therefore it was caused by a PKD Positive parent. This means they are breeding PKD positive felines. As such, they should exchange the animal or allow you to return it for a full refund)All our parents here are negative. 7) Are you a closed cattery? A closed cattery means the cats in the cattery are not exposed to any cats outside of that cattery. This means they don’t stud their males out to other breeders, and they don’t allow their females to be breed with males outside their own cattery. Most closed catteries won’t even show their cats in competitions. Closed catteries would love to have their cats championed. However, they won’t risk their felines’ health. It is very important to know if the cattery is open or closed. There are many infectious diseases and skin funguses passed between felines. Feline Leukemia, FIV, and Ringworm are just a few to mention. The only protection one has of purchasing a cat or kitten that has not been exposed to these contagious diseases and skin funguses is by purchasing them through a closed cattery. We are a closed cattery. *RINGWORM! It is not a worm. It is a skin fungus that spreads easily to both animals and humans. That is to say that it is zoonotic. Many cats in the show world have it. It is spread very quickly & effortlessly. Once you have it in your household, not only do you have to treat your cats and check yourself for it (yes, humans get it too), but you must sanitize the environment that you and the cats live in. Ringworm spores are connected to the hair follicles and skin dander. They fall off the animal and drop or float wherever they land. Ringworm spores can lie dormant for up to a year before finding a new host. Therefore, it can run into a cycle. You may clear it up and think you’re rid of it and a few months later get re-infected. Thus, ringworm is disastrous and extremely difficult to get rid of. If a breeder says he or she doesn’t have it in his/her cattery, yet treats all of the cats for it, run! They probably have it. We have never had ringworm at our cattery. 9) What age do you allow your kittens to leave their mothers? Kittens should not leave their mothers before 7 weeks of age. If a breeder says any younger than 7 weeks of age, then walk away and find another breeder. (Kittens need to be eating both wet and dry food/drinking water on their own and using the litterbox properly. They need to be completely done with nursing off their mom.) I personally feel if a kitten is on its own in terms of eating both wet and dry food, drinking water, using the litterbox properly, is well socialized and is no longer nursing on it’s mom then we feel it is better the baby leave at 7-8 weeks old so it can bond with it’s new family instead of us. Especially if someone is spending a good deal of money on a kitten they should be able to enjoy this phase of its life as well. All my Persian and Himalayan kittens for sale can not leave earlier than 7 weeks old. 10) Are your cats caged? Cats do not belong in cages. The only time they should be caged is if they need to be separated from the other cats due to illness. Cats are free roaming animals that need exercise and mental stimulation. Cats that are caged lose their muscle tone and ability to move properly. Eventually, they become mentally frustrated and exhibit behavior problems. Some of these behaviors are not using their litter box, constant meowing, scratching, or biting, being too rough with humans, extreme fear, etc. Kittens often copy the behavior of the older cats. Copy Cat was termed as such because cats copy each other. Therefore, if the adult felines exhibit this behavior, the behavior will become imprinted on the kittens who are being raised by and around them. We absolutely do not cage our cats and kittens. NEVER ever purchase from a breeder that makes you feel strange or uncomfortable about asking these questions. These are legitimate questions that all prospective clients should ask. If a breeder makes you feel uncomfortable about asking them, then he or she probably has something to hide. We here at Khloes Kittens welcome and encourage any and all questions at any time. * Please note-we do not accept deposits until our kittens are at least three weeks old to ensure the kittens are healthy and thriving. A kitten is a long term commitment, so please be sure you are ready, willing and able to care for your cat as all deposits are non-refundable. (If between the time a deposit is received and the time the kitten leaves we see there is an issue with your kitten then we will absolutely refund 100% of your deposit). *All kittens come with a contract which states a health guarantee. *I want to ensure the best homes for my babies therefore all kittens are sold solely at my discretion. I reserve the right of refusal to sell to anyone at any time for any reason.